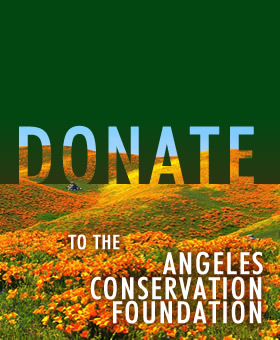 Q: What is the Angeles Conservation Foundation? The Angeles Conservation Foundation is a public charity which primarily funds conservation programs in Southern California and beyond. Q: Who runs the Foundation? The Foundation is governed by a board of directors who have a long history of service. Q: Are my donations deductible? Yes, donations to the Foundation are fully deductible, to the extent allowed by IRS tax rules. Q: How do you give out grants? Please refer to Grant Guidelines. Q: What is your investment policy? The Foundation’s endowment assets are invested in a variety of stocks and mutual funds to earn a stable and growing income. The most effective long-term way you can support the mission of the Foundation is to make a Foundation endowment the beneficiary of your bank or stock brokerage account or life insurance policy. The Foundation also welcomes donations. For more information or to indicate your interest in helping, please contact us at info@angelesconservationfoundation. Q: Can I restrict how my donation is used? Yes, you can also make donations or bequests for a specific purpose. For more information contact us at info@angelesconservationfoundation. Q: Does the Foundation invest in “green” companies? Yes, the Investment Policy is to invest in companies that on balance are not harmful to the public and the environment. Q: What are the Angeles Conservation Foundation’s administrative expenses? The Foundation has few expenses because all work is done by its volunteer directors, with no staff expenses. The Foundation does incur some administrative expenses, including insurance, bookkeeping, and printing and postage for fundraising mailings. Q: How Does the Foundation invest the funds in its endowments? The ACF invests mainly in well established companies with a history of growing earnings and dividends. Most of these companies will be in mutual fund portfolios like Vanguard’s Dividend Growth Fund. Currently the ACF endowment accounts earn approximately 5% a year. Q: What is an endowment? An endowment is a donation of money or property to a nonprofit organization for the ongoing support of that organization. The principal amount is kept intact while the investment income is available for use. Q: How can I contribute to an endowment? The easiest way is to name the endowment in your will or trust. Here is language you can use to include an Angeles Conservation Endowment in your Will or Trust. Q: Can I create my own endowment? Yes. While the existing Foundation endowments should meet needs of most donors, if you have some specified purpose, you can create your own endowment. We advise you to consult with us first so we can help you structure the endowment to accomplish your purposes. Q: Can I make a donation to an endowment during my lifetime. Q: Can I give money for a specific purpose? Yes. Simply include a letter with your check stating the purpose of the donations. If you want to make a bequest in your will or trust for a specific purpose, you can name one of the Foundation endowments as the beneficiary; or if you want to make a bequest for another purpose, simply contact us at info@angelesconservationfoundation. Q: How difficult is it to add an Angeles Conservation Foundation endowment to my will or trust? It is easy. You can simply include this language from our Wills and Trusts page. Yes, one of the simplest ways is to name the endowment as a beneficiary on a bank account or stock brokerage account. When you open a bank account, or have a life insurance policy, or have a stock brokerage account, you can name a beneficiary. If you name an Angeles Conservation Foundation endowment as your beneficiary, then assets will automatically be transferred to the endowment upon your death. If you already have a stock brokerage account, or bank account, you can easily change the beneficiary to the Angeles Conservation Foundation, or make the Foundation one of the beneficiaries, by filling out a form the bank or brokerage will provide you upon request.